Bad things are supposed to come in three’s correct? Try telling that to the 70 or so Lewes fans, players, management team and directors who were at the Longmead Stadium last Tuesday night. Two goals conceded, two players sent off both for two bookable offences, two players limped off by half-time and unfortunately just two shots on goal. It wasn’t one of the best away trips we had experienced in the past few years that is for sure. It is fair to say that the start of the season hasn’t been the best we could have hoped for. The fixture list threw up a difficult start but mix in a raft of injuries and suspensions and we had almost got to the stage where I would be polishing up the Puma Kings at least seven months earlier than normal. The Rooks went into the game with freshly-relegated Tonbridge Angels with all four first choice midfielders out injured, and finished it with two full backs playing at centre-half. After picking up just two points from the opening three games this could be the opportunity the Rooks needed to start their season. Tonbridge hadn’t started brightly themselves, still re-adjusting to the Ryman Premier League after a few seasons in the Conference South. In terms of Ryman Premier games, this was one of the more local games for me. By local I mean less than an hour’s drive away. With the little Fuller’s away learning what life was like back in the Seventies by staying at their grandparents up north, The Current Mrs Fuller jumped at the chance of a romantic night out in the heart of the Garden of England. Perhaps I oversold the “I will buy you dinner” part by failing to mention it was to be a hot-dog in the Longmead Stadium but I can get so forgetful at my age. Still, it was time together, as I tried to break the frosty atmosphere on the journey to the game. 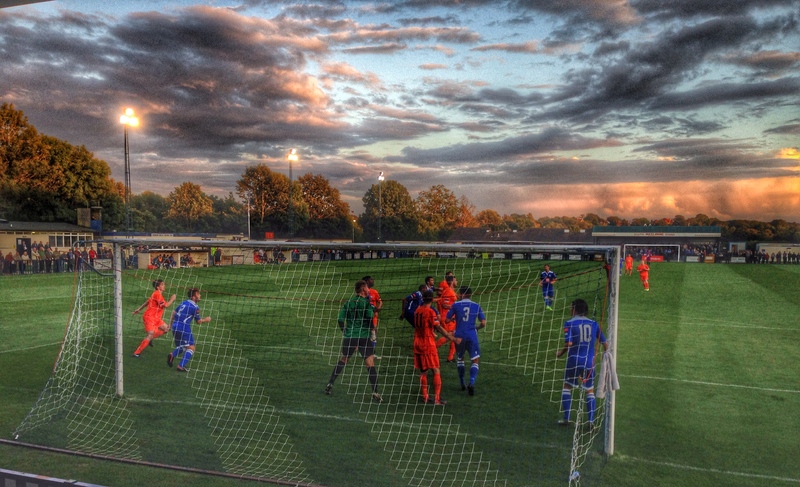 The Longmead Stadium is one of the better ones we will visit in the league this year. Decent size covered stands behind each goal and a nice size main stand down one side. They do have a very strange little stand for Directors only on the other side which I could have tried. They have a decent-size club house but annoyingly no beer can be taken outside although the view from inside isn’t bad. It had been quite a few years since we had played the Angels as we had passed each other as we were relegated from the Conference three years ago whilst they were going the other way. The added interest was the number of ex-Angels in the Lewes team including their former captain, Gary Elphick. 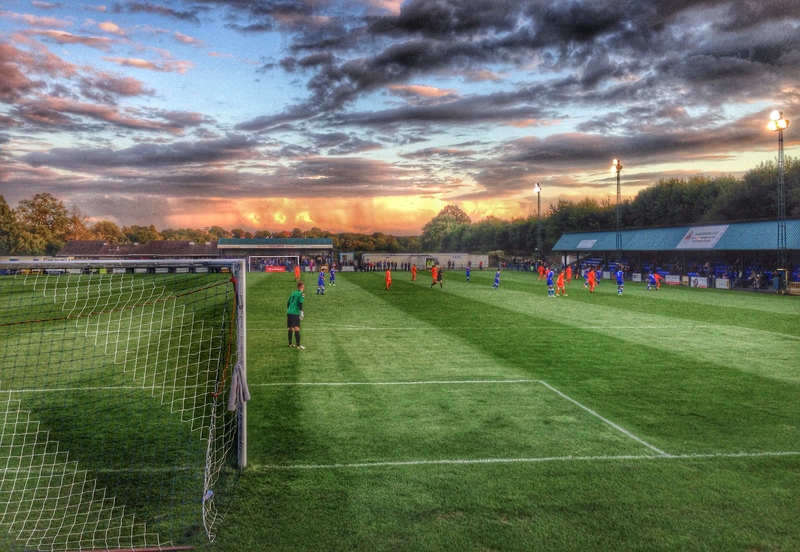 Tonbridge Angels 2 Lewes 0 – The Longmead Stadium – Tuesday 19th August 2014 Definitely a game to forget although the aftermath of two players suspended and two who will be unavailable due to injury for at least three weeks is one that will be fresh on our minds for a while. You cannot take anything away from Tonbridge – they took the chances presented to them without ever looking completely dominant. Even with Lewes down to 10 men they seemed reluctant to push forward to make the game safe. After a cautious opening twenty minutes Lewes were dealt a blow when full-back Alex Malins was forced off the pitch with suspected knee ligament damage. A few minutes later Tonbridge centre-half Jerome Sobers headed home unmarked from a corner. Sobers was Malin’s man to mark. Ten minutes later Malins was joined in the red cross tent by skipper Gary Elphick, much to the enjoyment of the home fans, with a hamstring injury. Ten minutes into the second period and Sanderson, on loan from Ebbsfleet United, picked up a needless second yellow card. Twenty minutes later and Ollie Rowe joined him after a harsh yellow for tangling with ex-Rook Billy Medlock. Still Tonbridge took a cautious approach, preferring to sit back and hold onto their lead rather than looking to make the game safe. But with ten minutes left they showed some genuine attacking intent when Okojie hit the booster button down the right, beat Logan, pulled the ball back for Teniola who made no mistake from close range. Game over. The defeat left Lewes in esteemed company at the wrong end of the Ryman Premier League table, joining some other sides quite fancied to be at the other end of the league including AFC Hornchurch, Hampton & Richmond Borough and last season’s Play-Off semi-finalists, Bognor Regis Town. Still, only 42 games to go. I’m sure we will look back at the indifferent start to the season in a few months and laugh….hopefully. *P.S – I learnt a few years ago about the power of titling blog posts in a particular away, so the term “Evil Angel” in no way relates to Tonbridge Angels, their team or their hospitality, rather than the fact a very large Adult film producer uses that title for some of their films and thus thousands of people search for it (allegedly).